New in mysteries this month: compelling thrillers by Mick Herron, Fred Vargas, Andrew Mayne and local author Tess Arlen. 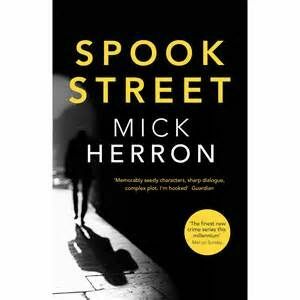 Mick Herron’s “Spook Street” (Soho, 320 pp., $26.95) is thoroughly gripping espionage, focused on intelligent plotting over action for its own sake — think le Carré, but with a heartier dash of dry humor. Slough House is home to the Slow Horses — British spies who can’t be fired (they know too much). Instead, they’re exiled from the action, generally because they’re incompetent, jerks, or both. But River Cartwright has been wrongly sidelined — he’s too smart, dedicated and resourceful. Cartwright is searching for his missing grandfather, a legendary retired spy with signs of dementia. The spy service is eager to find the old man and keep him from revealing (or forgetting) his headful of secrets. At the same time, the Slow Horses are part of a task force racing to find those responsible for a deadly bombing in a mall. Cartwright links the two stories, uncovering a rogue spy’s mad operation and a startling revelation about his own past. Not all of Herron’s characters are fully realized, with two outstanding exceptions: Roddy Ho, a young spy with delusions of studliness, and Jackson Lamb, the shrewd keeper of the Slow Horses, always ready to gleefully offend anyone in sight with a startling array of witty insults. Fred Vargas’ incomparable French homicide detective Jean-Baptiste Adamsberg is back in “A Climate of Fear” (Penguin, 410 pp., $16, paperback original, translated by Sian Reynolds). Adamsberg’s work methods are eccentric in the extreme: intuitive, slightly mystical, and full of seemingly random thoughts that brilliantly connect disparate fragments of a case. The author of “Black Fall” (Harpercollins, 384 pp., $15.99 paperback original), Andrew Mayne, is known as a bad-boy magician, but he’s also a prolific novelist. HIs book has a dynamite premise: FBI agent Jessica Blackwood comes from a family of famous magicians and in her work often uses her deep knowledge of misdirection and illusion. The impossible has happened — a videotape made by a dead Nobel scientist predicts an impending natural disaster — and the disaster strikes. Then another happens, and another, each foretold by a scientist who died eight years earlier. In the book’s second half, Blackwood’s gifts as a magician unfortunately take a back seat to complicated blam-blam action. Also, the book is quite serious, lacking the brazen cheek of Mayne’s stage act. Nonetheless, this is pretty cool stuff. Poisoned kedgeree is an unlikely murder weapon — but not in “A Death by Any Other Name” (Minotaur, 336 pp., $25.99), the third in Bainbridge Islander Tess Arlen’s engaging series about Lady Montfort and her down-to-earth housekeeper, Mrs. Jackson. In the days just before World War I, the pair wangles an invitation to a stately castle, hoping to vindicate a cook suspected in the death of an earlier guest there. Attention soon focuses on a group of amateur rose enthusiasts gathered at the castle. Bonus: a charming supporting performance by the famous real-life garden designer Gertrude Jekyll. Adam Woog’s column on crime and mystery fiction appears monthly in The Seattle Times.